Are you looking for a safe and reliable baby gate? Then you may want to consider the Evenflo Easy Walk Thru Top of Stairs Gate. 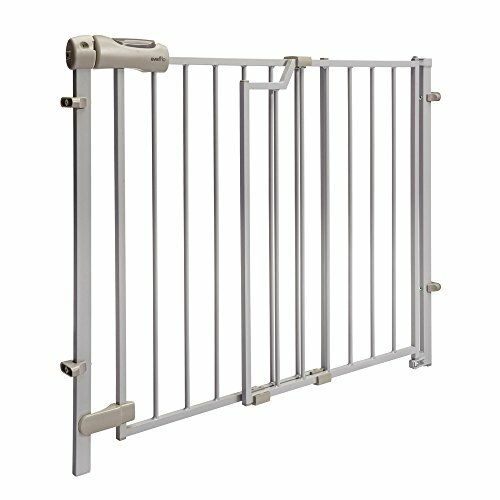 The Evenflo Easy Walk Thru Top Of Stairs Gate has been imported, and is made from metal. It has a removable swing stop to prevent the gate from swinging out over the staircase. This features a one-hand release handle that is easy for parents, but difficult for children to unlatch. A nice feature is the red/green lock indicator, which will show if it properly locked. This product will extend 29 to 42 inches wide, and is 30 inches tall. This is a hardware-mounted gate. As of this writing there were 635 customer comments and 169 answered questions for the Evenflo Easy Walk Thru Top Of Stairs Gate. I've read through the customer feedback, and then condensed the results into this review. I hope that this helps you when shopping for a baby gate. "I am giving it 3 stars as it will do its job and it's a decent price, but if you need something a little more solid, I would look elsewhere." "It does take some tweaking, and honestly I can see why some people might think it's a little tricky to get installed, but I'm giving 5 stars just based on the sheer durability and heavy-duty build. Get the adjustments & installation right and you'll have a gate that can handle the harshest punishment." "Be warned, these MUST be drilled into a STUD in the wall. Do not mount these into Sheetrock only as they are heavy and can easily rip out of the wall. If you don't have a stud near your stairs, you can use a piece of wood to extend out and give a proper base to mount the gate to." "It opens easily with one hand and with minimal effort. It stays open when I want it open and all you have to do is swing it shut and it will latch itself. My five year old can operate it with no problem. It feels sturdy and secure. My baby and 75 lb dog have pushed against it with no issues. I have had it for about a month now. It is exactly what I need in a baby gate." "It's perfect for families with older kids, because of the green and red indicator showing whether the gate is closed properly or not. It's an easy reminder for my 5 year old to make sure it's shut and safe so her baby brother doesn't fall down the stairs." The Evenflo Easy Walk Thru Top Of Stairs Gate is a no-frills simple gate to operate. It's not fancy in its design but will hold up if installed correctly. This is a hardware gate. This means that you will have to attach it to a wall, preferably into studs so that it does not come out. Do not use this in drywall. When you want to open or shut the gate, simply squeeze down and push. The price is low and also fair for what you get. I hope that my review of the Evenflo Easy Walk Thru Top of Stairs Gate can help you decide if you should buy this baby gate!